Summer’s hot weather means we are all craving lighter foods on our party menus. This Crunchy Honey BBQ Chicken Salad recipe is a delicious option to serve a gaggle of guests because it can be prepped ahead of time and assembled right before the party starts. We’re big fans of main course salads when the weather heats up, and this Crunchy Honey BBQ Chicken Salad fits the bill perfectly. We’ve been crushing on Gold’n Plump® SHAKERS for months now (remember our Chicken Parmesan Sliders? ), and we’re delighted to find a way to incorporate our favorite chicken into our summer entertaining menus. 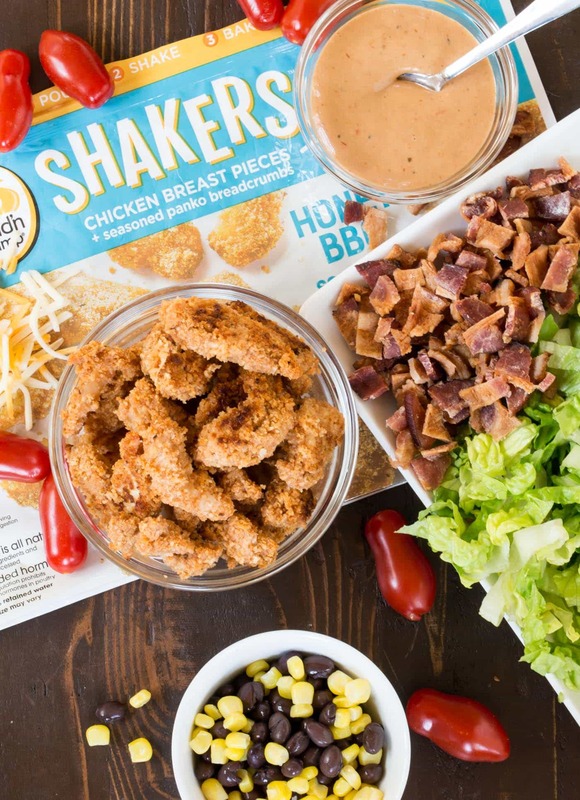 Prep for this Crunchy Honey BBQ Chicken Salad couldn’t be easier. Start with a bag of Gold’n Plump Honey BBQ SHAKERS. Made from chickens raised with no antibiotics-ever, the 100% boneless skinless chicken breast pieces are perfectly sized for salads. Simply pour the fresh chicken and the seasoned breadcrumbs into the bag, seal, shake and bake. No touch and less mess – brilliant! I like to bake my SHAKERS ahead of time (usually in the morning before the house starts to heat up for the day) and then pop them in the fridge until I’m ready to assemble the salad. 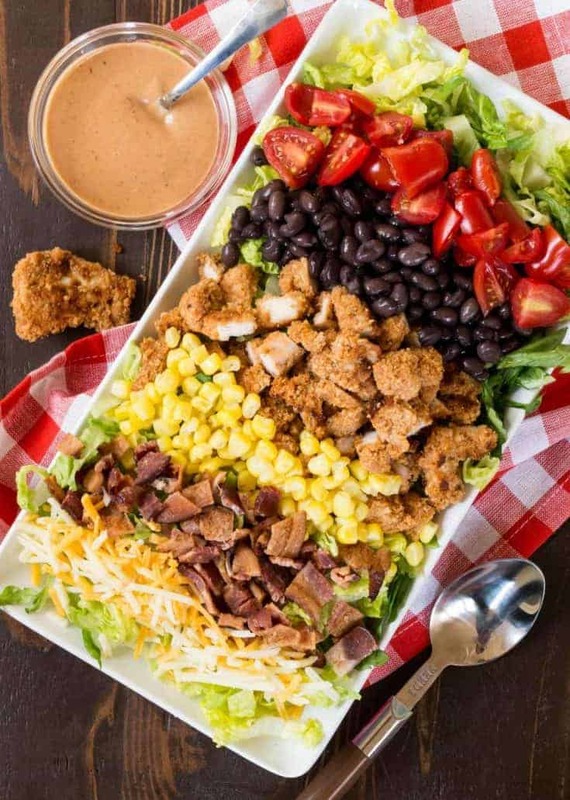 Shortly before guests arrive, I top a big platter with crisp romaine lettuce and add the SHAKERS as well as generous portions of the usual BBQ chicken salad suspects including corn, black beans, bacon, cheese and tomatoes. A savory mixture of BBQ sauce and ranch dressing is the finishing touch that brings all of the flavors together in this Crunchy Honey BBQ Chicken Salad. Invited to a potluck? This Crunchy Honey BBQ Chicken Salad is easy to tote to a picnic or party. It’s also a great recipe to prep for protein-packed lunches all week long. Pin it today! Tip: SHAKERS are available in Savory, Sweet Chili, Jamaican, Honey BBQ and Chipotle Adobo flavors. Check out the Gold’n Plump website for more recipe ideas using all five SHAKERS flavors. Or find them on social media, including Facebook, Twitter and Pinterest. Bake SHAKERS according to package directions. Set aside. Combine equal parts ranch dressing and BBQ sauce in a bowl. Whisk to combine. Place lettuce on a large platter. Top with beans, corn, tomatoes, bacon, cheese and chicken. Drizzle with BBQ ranch dressing. I didn't include specific ingredient quantities for the salad as I find most people add the amounts they prefer anyway. (Bacon fans, I'm talking to you.) 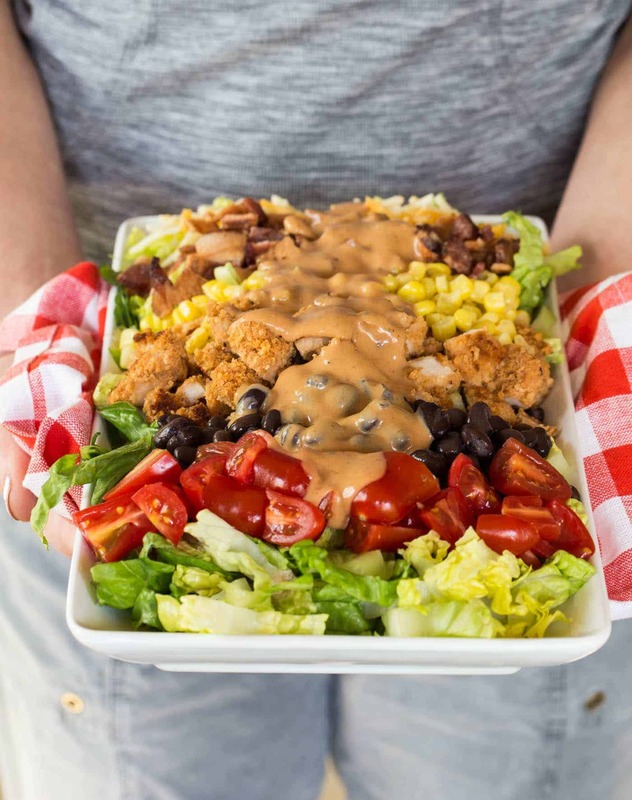 But as a helpful point of reference, the salad photographed above used approximately 1/2 of a package of SHAKERS, 1/3 cup ranch dressing, 1/3 cup BBQ sauce, 2 small heads of romaine lettuce, 1/2 of a 15-ounce can of black beans, 3/4 cup of corn, 1/2 pint of grape tomatoes, 6 slices of bacon, and 3/4 cup of cheese. Hi Phyllis, You can easily feed 4-6 people with the salad but feel free to bulk up the veggies to stretch the servings even more.